CMOS scaling has been the mainstay of the semiconductor industry for last few decades. MOSFET channel lengths have been scaled from about few microns length in the 1990's to about ~ 25 nm by 2009. However as we shrink channel lengths further below 20 nm new device designs and materials are needed to sustain the device performance. In this group we work on different aspects of transistor designs that range from new transistor designs i.e. 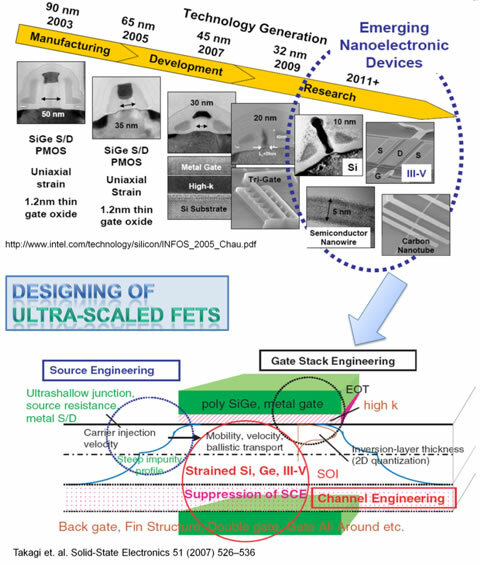 Tunnel FETs to usage of new materials i.e III-V,SiGe etc. 3D full-band quantum transport simulator based on the atomistic tight-binding theory. 2D semi-classical top-of-the-barrier using atomistic tight-binding theory. III-V based NMOS transistor designs – HEMT’s, Multigate-FET’s. Collaborate with experimentalists in providing a theoretical understanding.